President Barack Obama is looking to regain momentum against Republican nominee Mitt Romney at tonight’s debate, but a leading expert says that on Israel, at least, very few differences between the two candidates will emerge as the two prepare to battle. Brian, whose recently published book examines every American president’s record on Jewish and later, Israel issues, says that the only key difference between the two candidates is their rapport with Israeli Prime Minister Netanyahu. Brian says that Obama is intensely pro-Israel and rates him among the top in terms of his support for Jewish issues. And who ranks at the bottom? Former Pennsylvania Senator Arlen Specter, the son of a Jewish immigrant from Ukraine, died Sunday at age 82 after a battle with non-Hodgkins lymphoma. Specter’s 30-year senate career, lasting from 1981 until 2011, earned him the title of longest-serving Pennsylvania senator. In 2009, the moderate Republican joined the Democratic party, a move that ultimately cost him his Senate seat. Earlier in his career, the Yale Law School graduate served as a Pennsylvania state prosecutor and a lawyer for the Warren Commission. Specter was an outspoken supporter of Jewish values. The Union of Orthodox Jewish Congregations of America, the largest Orthodox Jewish association in America, wrote that Specter was a “staunch supporter of a strong U.S.-Israel relationship, fierce advocate for religious liberty, promoter of freedom for Soviet Jewry and more” in a statement on their website. “Senator Specter has left behind a proud legacy of public service that will hopefully guide future generations of public servants, Jewish or not,” said National Jewish Democratic Council Chair Marc Stanley and CEO David Harris in a statement released on the NJDC website. Today, President Obama issued a proclamation stating that all flags be flown at half-mast out of respect for Specter. But Rubin, 33, who was born blind, has not let obstacles block her path to success. The Oberlin- and Yale-educated solo singer, who has appeared in solo recitals and performed alongside opera star Frederica von Stade, continues to travel to performances across the United States. In addition to a booming singing career, Rubin is also balancing a jewelry line and the release of her new memoir, Do You Dream In Color? Insights From a Girl Without Sight, which will hit bookshelves October 23. “Music has helped me see in a different sort of way,” Rubin said. A lack of sight enriches Rubin’s sense of the music; she describes instruments as having colors, and different character. Drawn to music at an early age, Rubin always had the idea that classical was her calling. “I told my teacher that I didn’t want to sing pop music, but I wanted to sing like Christine in Phantom,” Rubin said. But with musical success came the struggle of finding venues to perform. Wary producers often shied away from the idea of having a blind performer onstage . “Their vision of blindness is somebody who is fumbling in the dark without their glasses on,” Rubin said. Rubin’s drive to redefine the perception of blindness is not new. As the first blind bat mitzvah at Valley Beth Shalom in California, Rubin started to accept the role of being a pioneer for people like herself. Rubin’s Jewish identity has played a large role in her musical career. When her friend, Israeli composer Noam Sivan, was tasked with writing a piece for her in 2008, Rubin recalls begging Sivan to write a Hebrew piece of music. According to Rubin, her Jewish identity and connection to Judaism are central to the first few chapters of her book. The book also explores the answers to questions Rubin believes others would ask but are afraid to. The book’s title–“Do You Dream in Color?”–is the question Rubin says she is asked most. With her book in stores soon and several performances on the horizon, including two concerts in Washington, DC on October 22 at the Kennedy Center and October 23 at the National Endowment for the Arts, Rubin hopes to continue sharing her story with a wider audience. “There is something about sharing your ideas through music that seems to reach people’s hearts,” Rubin said. Saturday night I got to shepp a little nachas when Moment swept the Religion Newswriters Association awards ceremony, winning first place for Overall Excellence as well as three other honors. In addition to the award for overall excellence, the magazine won first place for graphics with its Ten Commandments 2.0 Symposium. The illustration was created by uber-talented designer Navid Marvi, who also won third place for design and layout with a detailed photo essay on Jews in Iran. 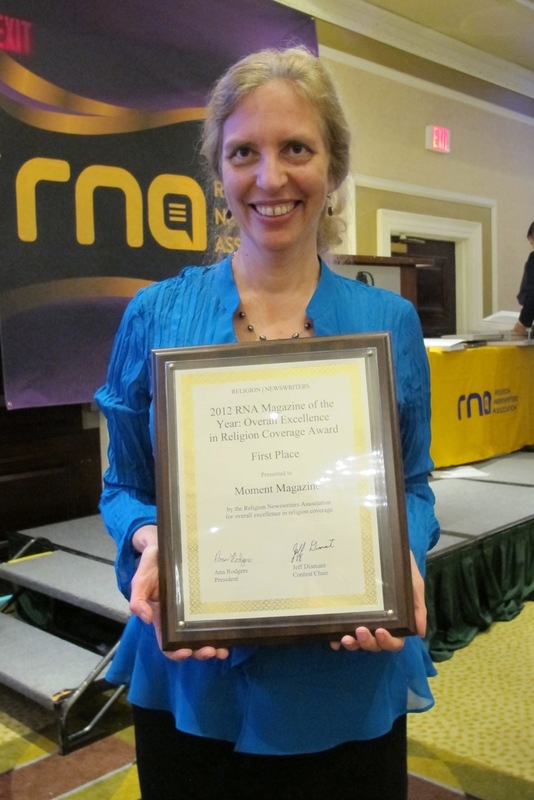 Editor and publisher Nadine Epstein won an award for her 2011 investigation, The Other Rosenbergs, which recounted the never-before-told story of two innocent Jewish engineers who lost their jobs at the U.S. Army Signal Corps at Fort Monmouth, N.J. after the arrest of Julius Rosenberg because their last names were Rosenberg. The story was funded by the Fund for Investigative Journalism.